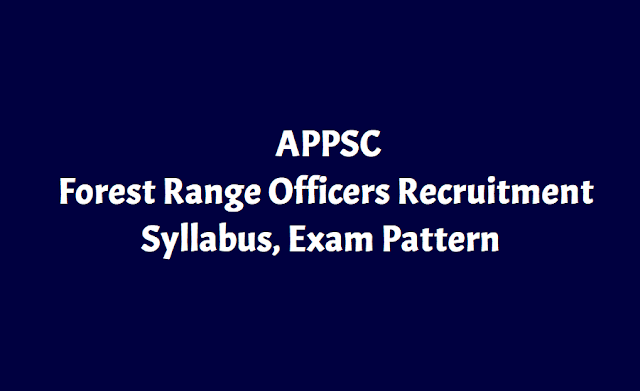 APPSC Forest Range Officers Recruitment Syllabus, Exam Pattern Approved by AP Govt: APPSC is going to recruit the Forest Range Officer posts in A.P. Forest Department. In this regarding, APPSC Has framed the Scheme of Exam and Syllabus and send to the AP Govt for the review of the Scheme of Examination and the Syllabus for recruitment to the post of Forest Range Officer. Government has approved following following Scheme of the Examination after careful examination of the request of the APPSC for recruitment to the post of Forest Range Officer in A.P. Forest Service. The Forest Range Officers AP GO Details as follow..
GAD - Proposed Scheme of Examination for the recruitment to the post of Forest Range Officer in A.P. Forest Service through Andhra Pradesh Public Service Commission - Accorded- Orders-Issued. 4. From the Secretary, APPSC Letter No. 692/SS/2018, Dated:01.11.2018. In the reference 1st read above, Government have issued the scheme of Examination for recruitment to the post of Forest Range Officer in A.P. Forest Service. 2. In the reference 2nd read above, Government have abolished the interview system to the post of Forest Range Officer. 3. In the reference 3rd read above, the Finance Department have issued Finance clearance for 20 posts of Forest Range Officer in A.P. Forest Service. 4. In the reference 4th read above, the Secretary, APPSC has informed that, the Commission constituted the Experts Committee, which met on 25.10.2018 at the Commission’s Office. The Committee discussed the present syllabus, pattern of the examination and other relevant issues pertaining to the post of Forest Range Officer in A.P. Forest Service in context of present scenario and job recruitments of the department. After detailed deliberations, the Committee observed that the present scheme of Examination is not evaluating the aptitude of the candidates towards Foresty & Wild life which is prime requirement to judge the suitability of the candidate for A.P. Forest Department. Hence, The Committee recommended for common paper of General Foresty I & II for all the candidates, so as to evaluate the aptitude of the candidates towards all the aspects Forestry and wild life and requested to issue early orders in the matter. b. Computer Proficiency Test (Qualifying Test) for eligible candidates in the ratio of 1:3 with reference to total number of vacancies notified. iii)As per G.O.Ms.No.235, Finance(HR-I, Plg&Policy) Dept., dt.06.12.2016 each wrong answer will be penalized with 1/3rd of the marks prescribed for the question. iv) The minimum qualifying marks for selection is 40% for OCs; 35% for BCs and 30% for SCs & STs. 6. The Secretary, Andhra Pradesh Public Service Commission shall take necessary action in the matter.